Timeless detailing, unpretentious style... Geneva succeeds in capturing the essence of traditional design. Geneva is characterized by the refined flowing lines of its arched spouts. Both the lavatory and Roman tub filler spouts bring the water well above the bowl or tub for a beautifully controlled cascade of water. But the true art of the Geneva line is in the carefully detailed cross and lever handle designs that inspire a traditional warmth without a hint of overstatement. These details are complimented by a gentle flair at the base of the spout and handles that echoes the overall design motif. 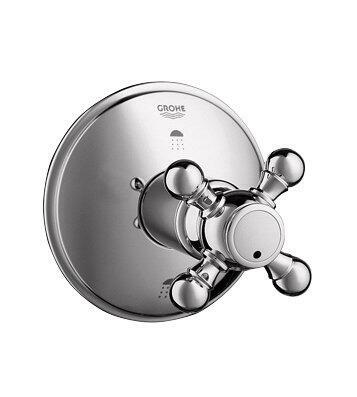 A complete bath line, Geneva includes faucets, shower valves, shower arm, and diverter tub spout, as well as shower trim for use with either Grohtherm© thermostatic temperature control valves or Grohsafe© pressure balance valves. All components can be coordinated to feature Geneva lever or cross handles.